EthicalFoods.com | What to Eat After Getting Your Wisdom Teeth Removed? My housemate recently had one of his wisdom teeth removed. It wasn’t impacted, so the surgery was fast and clean. He needed to have soft, healing foods for the first two days. Here are some suggestions on what to eat after getting your wisdom teeth removed. Roast pumpkin at 375 until soft. Scoop out and discard seeds. Remove flesh from skin and place pumpkin in blender. Peel potatoes. Cut them into quarters and boil util soft, along with ginger and turmeric. Discard ginger and turmeric, placing boiled potatoes into blender. Add stock or coconut milk and blend until completely smooth. Add curry powder and salt to taste, blend until fully incorporated. Serve warm, not hot, just a little warmer than body temperature is best. Using an electric juicer, juice all ingredients and serve at room temperature. Don’t drink with a straw…no straw drinking is allowed after surgery. Place one teaspoon of slippery elm bark into a mug. Pour boiling water over it and stir. Let this sit and cool until it’s just barely warm. Slippery elm bark is mild, easy to digest, nourishing and is both soothing and healing for open wounds. If you want to flavor it, a bit of powdered cardamom and cinnamon is delicious. You can add some raw honey as well. Pour boiling water over a tablespoon of comfrey root. Let this steep for at least a half hour and strain thoroughly. The resulting tea will be kind of thick or have a bit of body to it, because comfrey root is full of mucilage (that’s a good thing). Comfrey has excellent healing properties for repairing skin wounds, and also healing broken bones. Another herbal infusion that’s really good for wound healing and easing inflammation is calendula. I grow them in my garden, harvest and dry them. They are easy to purchase, if you don’t have your own supply. Just pour boiling water over the flowers and steep for 10 minutes. Serve barely warm or at room temperature. Other foods that may be appreciated are organic kefir, applesauce (if you don’t make it yourself, do read the label to ensure there are no industrial ingredients) and completely smooth protein shakes, which you can make at home in your blender. I prefer Sun Warrior unflavored protein powder, which is made from organic fermented brown rice. 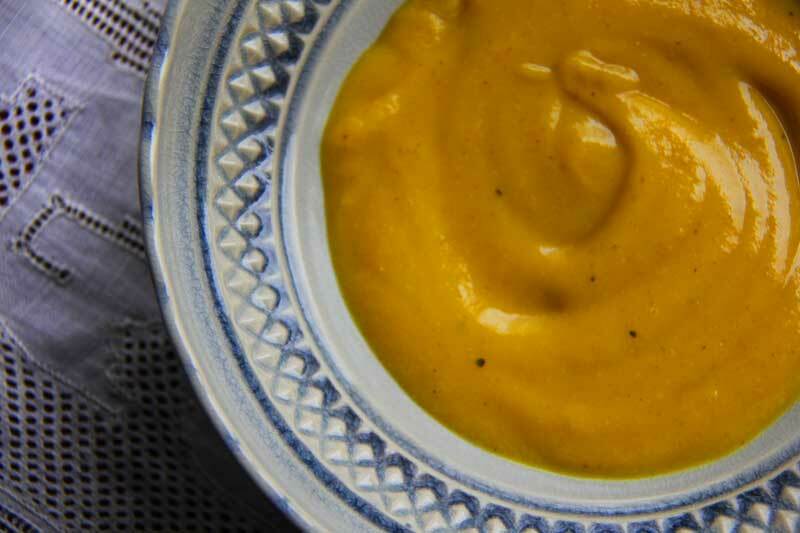 You can even put a little into your pumpkin soup and blend well. Coconut yogurt is also a good choice, you can see the recipe here. Avoid anything fibrous, anything with particles or a gritty texture, using straws and foods that are too hot, cold or sweet. Obviously, you can eat Jello, chocolate pudding and milk shakes, but these are going to play havoc with your blood sugar and will not help you heal. Refined sugars are inflammatory. After the first couple of days, you can usually move on to other soft foods that require minimal chewing, such as very soft scrambled eggs, savory rice porridge (jook), raw oysters (assuming you just throw them back rather than chewing), small cubes of tofu in miso broth, tomato bisque, mashed (peeled) potatoes, skinless baked sweet potatoes, seasoned soft-roasted eggplant (think: baba ghanoush).